About 10 million turkeys are expected to be eaten in the UK over Christmas with most people unaware of how the bird on their plate was killed. All that could change under proposed EU legislation that would require the labelling of unstunned halal and kosher meat, to the chagrin of Muslim and Jewish groups. All meat and meat products “derived from animals that have not been stunned prior to slaughter ie have been ritually slaughtered,” would have to be specified as such under amendment 205 to the EU food information regulations. The stated aim is to allow consumers to make an informed choice, consistent with their ethical concerns, but opponents argue it is discriminatory. “If you are only labelling meat provided for Muslims and Jews you are discriminating against Muslims and Jews,” said Shimon Cohen, campaign director for Shechita UK. Cohen said many more animals are “mis-stunned” and thereby suffer “excruciating pain” than are slaughtered under the shechita slaughter method, from which kosher meat is obtained. Opponents fear labelling would cut demand for ritually slaughtered meat, causing producers to pull out and forcing prices higher for remaining consumers. Compassion in World Farming (CIWF), which lobbied for the amendment, cited a report by the UK Farm Animal Welfare Council which found that cutting the throat without stunning induced “significant pain and distress” to make its case. 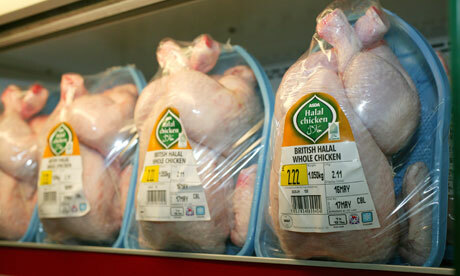 Emotions among Jews and Muslims have been inflamed by far-right groups such as the British National Party and English Defence League whipping up opposition to halal meat – the former describes it as a “barbaric and disgusting Islamic tradition” – while not targeting kosher meat. The Conservative MEP for North West England, Sajjad Karim, who is a Muslim, received threatening emails after voting against the amendment. Yunus Dudhwala, chairman of the Halal Monitoring Committee (HMC),, which certifies halal products in the UK, said animal welfare was a “red herring”, adding that there was a relative lack of interest in factory farming and animal transportation conditions. “If people are really concerned about animal welfare the rest of the journey of the animal [before slaughter] really needs to be looked at,” he said. Dudhwala said he would be happy for unstunned meat to be labelled if other meat carried the method of stunning used, such as gassing or electrocution, but believed that would never happen because it would be unpalatable for consumers. The other UK halal regulator, the Halal Food Authority (HFA), which approves of stunning before slaughter providing it does not kill the animal (the HMC argues it is impossible to guarantee this), supports labelling of unstunned meat. Anti-labelling campaigners won the latest round of the battle earlier this month when a council of ministers’ committee did not vote through amendment 205. It could be re-introduced in the European parliament when the second reading of the bill takes place and be enshrined in law by the middle of the next year, although producers would be given a grace period to comply. Agriculture food minister James Paice said last month “the government would like all animals to be properly stunned before they are bled to slaughter” but that labelling should be addressed as part of next year’s consultation of European animal welfare regulations rather than within tfood information regulations.